One of the singularly American experiences is the Gun Show. 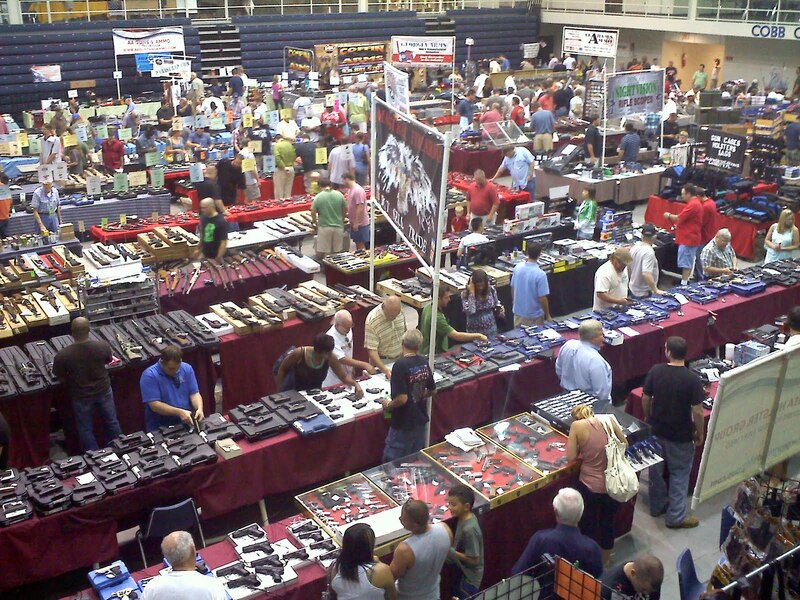 This past Sunday I attended the RK Gun Shows show at the Cobb County Civic Center in Marietta, Georgia. There were easily a couple of hundred vendors at the show, which made it among the largest I’ve attended at the Cobb Civic Center. This is a relatively small venue, so the shows there will nevre reach the size they would at the Farmer’s Market, or the South Atlanta Expo Center. But, this show limits vendors to guns and gun related stuff, and that makes a difference. The show was well attended, too, with the aisles full of shoppers, as well as people filling out for 4473’s for purchases. Gun shows run the gamut. There are shows that almost exclusively guns and gun related vendors, like BDU’s and survival guides. Then there are shows that allow just about anyone in, including jewelry and all the “As Seen On TV” stuff. This show was more toward the first end, and I enjoyed it. Yes, there were Airsoft guns and a lot of imported pocket knives, and there was at least one vendor selling all non-lethal personal protection wares, like pepper spray and tasers. I usually don’t think much about what I’m seeing at guns shows. I’ve been going so long that I can easily size up a vendor, and decide to move on or to stay and look. But today I made it a point to try to classify the vendors. Here’s what I saw. At one end is the Collector. He has a wide variety of older weapons, usually handguns, and they are not in the best shape. They are all displayed behind a glass case. He also has several boxes of older ammo to match. The prices on these guns are rather high. Knowing nothing about the antique firearm market, I don’t know if they’re priced right or not. I look, but I never ask about them. Move along. There is the Hobbyist Collector. His table is full of an interesting variety of guns, from old police .38’s to 1911’s, to Winchesters to SKS’s. There are no Japanese Nambu’s or Spencer carbines. He sells what he collects, and he collects what he shoots. He has a booth at the show so he can mix with the other dealers, and get a great deal on his next gun. There is the Small Gun Shop. He has a store, and he brings a few popular guns to the show. He also installs sights and does gunsmithing, because that’s how he got into the gun selling business. I used to know a fellow like this, and I worked a few gun shows with him. I bought a .22 Buck Mark from him once, and it was one of the best experiences I ever had. The gun worked flawlessly, and it shot exactly where the sights pointed. Sadly, I had to sell it, and now that my fortunes have turned, I’ve replaced the Buck Mark, but this one just doesn’t shoot like that first one. There is the AR shop. They carry everything from stripped lowers to fully assembled guns, with parts from every make you can think of. They also sell a range of assembled uppers, from 10 inch carbines to full stainless target barrels. And they carry slings, and sights, and stocks. There is the Large Gun Shop. One is a guns store, and one is a pawn shop. This store has 6 tables spanning 2 aisles. They have 2 or 3 of every model Glock and Smith and Springfield, and they have HK’s and Rugers and just about every gun you’ve ever heard of. And they have a section of small .380’s and .25’s from companies you’ve never heard of. Their prices are good, and in fact, they’re better at the show than they will be on Monday back at the store. And they are selling a lot of guns. There’s the holster table, with a row of blue guns, and a rack full of leather. Some of them sell brand names, the ones you see in the magazines. Others sell brands you’ve never heard of. Those are very good holsters, though – I know, because I own some of each, and the no names hold up just as well as the brand names. Then there are the ammo vendors, and these run the spectrum, too. On one end are the companies that load there own, and sell by the 50 round plastic pouch, or the 1,000 round ammo can. If you look, you can find any kind of ammo you want, from light weight FMJ to full power +P hollow points. I’ve shot this kind of ammo, and it wasn’t bad. There are the ammo vendors that sell name brand ammo by the box or by the case. Their prices are not bad, and they have plenty of it. Then you run into the ammo vendor who has the same ammo, and $3 a box more than anyone else. But, in wonderful Capitalist style, he’s not selling. I’m not sure he knows it though, because he’s not reducing his price. There are the ammo vendors that sell odd boxes of strange ammo. East bloc surplus 7.62x54R hunting ammo. Stuff in boxes that look like they’ve been in the warehouse where they took the Ark at the end of Raiders. And, in between, are boxes of Blazer aluminum cased .38 special, for twice the price of the table two aisles over. I guess they figure if you finally find that one box of .45-120 Govt, you’ll pay what they want for the other. There are the tables full of Chinese optics and Weaver rails and vertical foregrips. The optics are cheap, $50 for a reflex scope that runs $400 with a name brand on it. One day I’ll buy one and see if it holds up. I know the $8 foregrips do just fine. There are the tables of bumper stickers and Army survival manuals and amateur James Bond stuff, all with the proper disclaimers. There are the knife tables, with no name imported folders, Bowie knives, scimitars, and Claymores. There are the tables with sharpening stones and crossed ceramic sticks. Which do work, by the way. There are the Gun Rights tables. GeorgiaCarry is here, and the NRA. At some shows, the BATFE has a table, reminding you not to lie for the other guy. They aren’t here today. I guess they have a thing against hypocrisy. And there are the Jackpot tables, the ones who sell 1911 parts and cleaning swabs and dental tools, and magazines and springs and followers. And ruck sacks and canteens. And rifle barrels. Heavy target barrels for Ruger 10/22’s. At prices that are lower than catalogs or the interwebz. And don’t charge sales tax. Bingo. So, today, I looked, and I talked to people, and I shopped. And I bought a 10/22 barrel, and some single point slings, that will work just fine on my SKS and my 10/22 and my son’s Airsofts.